Fairview Cemetery is located on the west side of the city of Fountain at 757 South Santa Fe Avenue. To reach the cemetery, leave Interstate 25 at Exit 128 and proceed east approximately one-quarter mile. Turn south at the traffic signal, and the cemetery is a short distance on the west side of the road in a light-industrial area. According to GPS-derived geolocation (accurate to within 10 meters), the cemetery's coordinates are 38°40'19.3"N and 104°42'23.6"W. The city of Fountain maintains both the records and grounds of the cemetery. Cemetery records are located at the City Clerk's office, 106 Main Street, Fountain, CO 80817; telephone: (719) 382-8521. The hours of the cemetery are dawn to dusk. 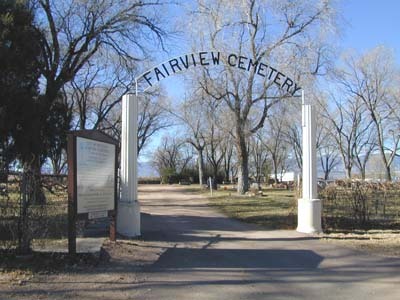 Fairview Cemetery is located in a low-lying area, one-quarter mile west of Fountain Creek. The cemetery offers a view of Cheyenne Mountain and Pikes Peak to the northwest and the trees of Fountain Valley to the east. The grounds are well maintained and contain many mature trees. The cemetery contains several monuments and many historic headstones that date to the late nineteenth century. By 1997, more than one thousand burials had taken place. For the purposes of this index, the cemetery layout consists of blocks numbered 1 through 35. The map provides adequate detail to find the general location of the gravesites.